I worked on four Indy Pace car paint schemes, all Buicks. The first one was a 1975 Buick Century with the last year of the old couple A-body design. I don’t remember anyone dictating or suggesting the flag graphics on the body side. The body design itself seemed to suggest to me a waving flag, so that’s what I proposed. Studio management bought the idea from the first sketch (probably to get the project over with as soon as possible). The country was anticipating the 1976 bi-centenial, so the paint scheme was in anticipation of all things patriotic. 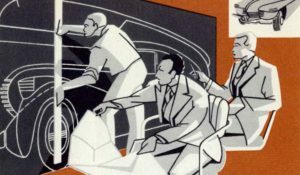 Buick’s buyer demographics was the aging car buyer, and “Free Spirit” was a marketing term attempting to capture more youthful image. I don’t remember where the Hawk silhouette came from. I do remember having a battle over the orientation of the “Free Spirit” hawk graphic. 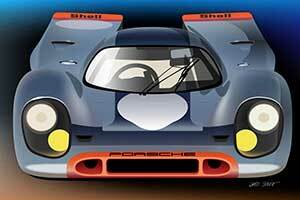 Whenever the graphics was attached to a car, designers were laying the hawk back on it’s tail. I insisted that it be vertical, like the old Richfield emblem. I must have gotten my way. 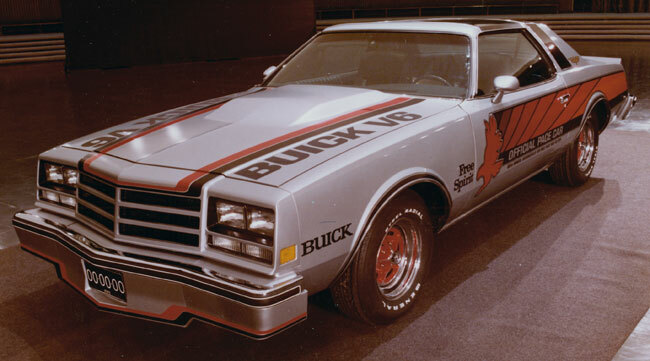 The 1975 Buick Century Pace Car had a 7.5 litre (455cid) V-8 and was anything but stock. There was really nothing very performance oriented in the Buick production lineup by 1975. 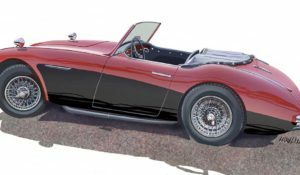 The replicas had 350s, GR70x15 radials, and heavy-duty suspension. They shared the same graphics with the real pace cars. I believe that the 1975 Buick pace cars may have been the first to be retrofitted with removable roof panels, or a T-tops. They first appeared on the 1968 Corvette. 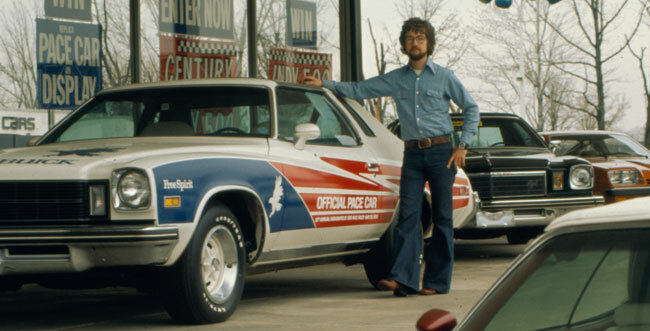 Me posing in front of a replica at a Buick dealer in 1975. 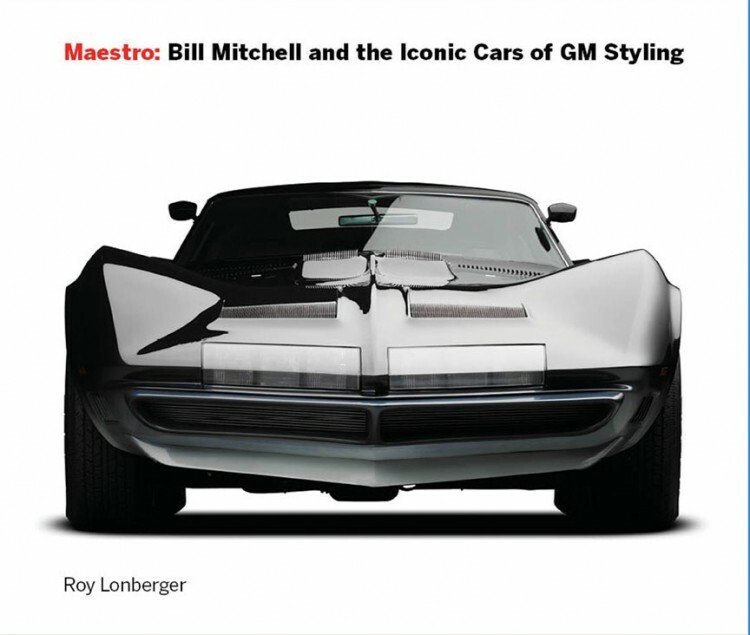 It’s not that I thought it was such a great design, but I had only been at GM two years. 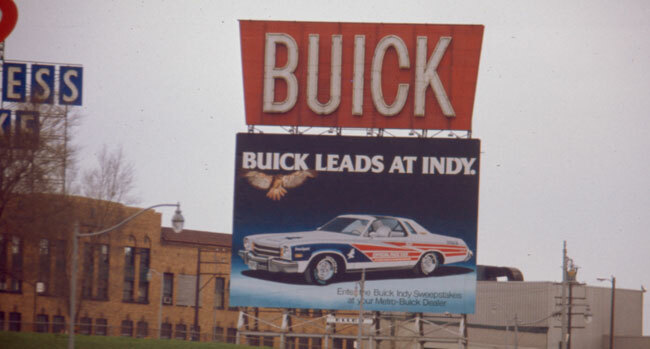 1975 Buick Century Pace Car on a billboard somewhere in Detroit. 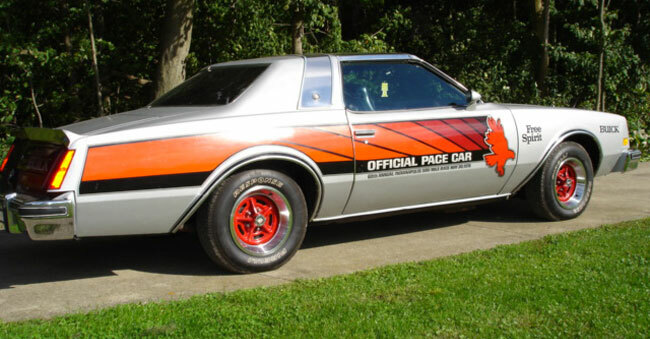 The 1976 Buick Century Pace Car had more extensive styling and mechanical modifications. One thing to note is that the real pace cars and the replicas differed graphically. The replicas didn’t have the front air dam or the blistered hood. The replicas did have the originally proposed side scheme that started at the front of the doors. The idea was to have the shapes coming from the hawk like an abstract stop motion photos of flight. Bill Mitchell made me extend the graphics to the front of the car in front of the hawk for reasons unknown. His change didn’t make it into production. My guess is that it was cheaper to make. I think the shorter graphics look a great deal better. A bit of trivia. Buick lettering at the time looks like all capital letters, but in fact the “U” is in lower case with the stroke to the right side enlarged to go with the other letters. 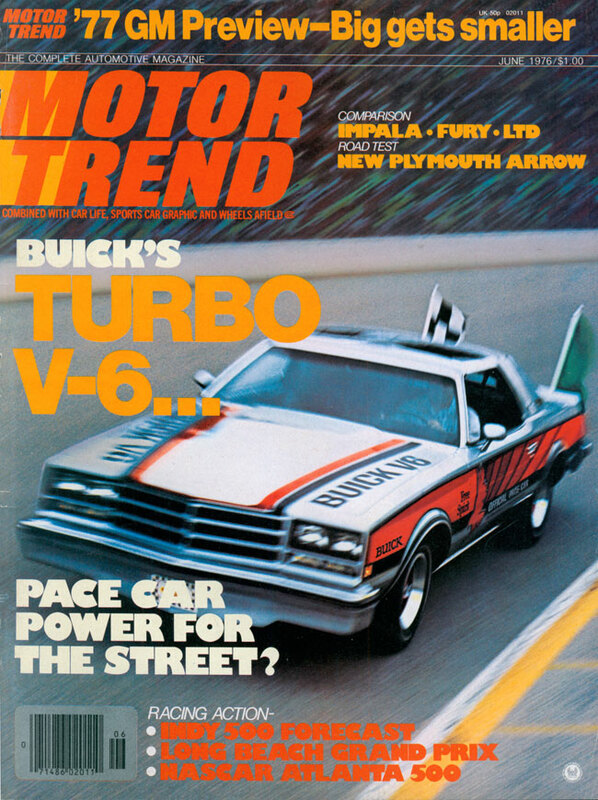 1976 Buick Century Pace Car on the cover of Motor Trend. Photo shows the full graphics that were on the actual pace cars. That car looks pretty good blurry. The front and rear air dams and the hood blister were modeled in the studio. This photo of the 1976 Buick Century Pace Car model photographed in the Design Staff Styling Auditorium shows the hood blister and front air dam. Why did the 1976 Buick Century Pace Car have a turbocharged V6? 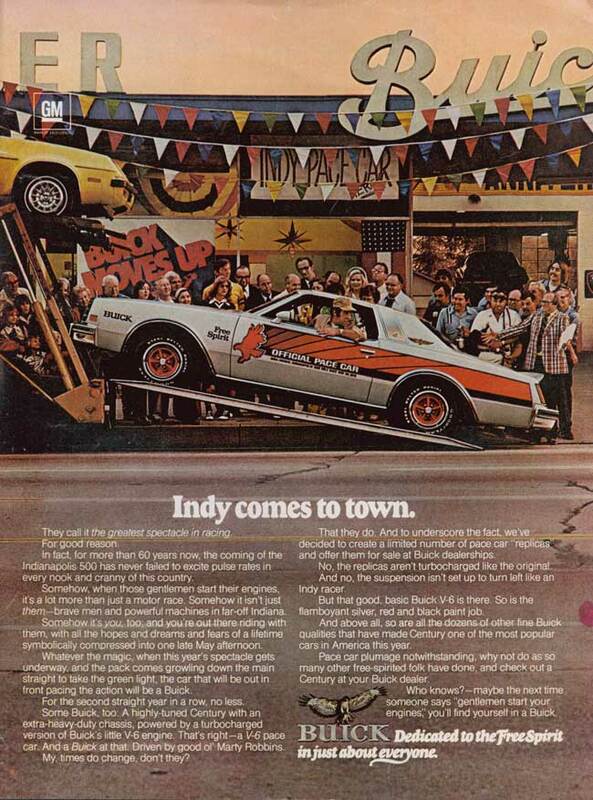 The ’76 pace car had a turbocharged 231 CID V6, almost half the size of the 455 in the ’75 car. It developed around 306 hp. Why did Buick use a V6, and how did Buick get involved with turbocharging? Everything was downsizing in the ’70s, and Buick needed a smaller engine. Instead of developing a small V8, they bought back the V6 that was developed in the early 60s from American Motors where the V6 had found a home in various Jeeps. They reinstalled the tooling for the engine in the original room where it all started. According to Mike Knepper, Motor Trend June 1976, the turbocharging program came along by accident. During the same time that the ’76 Indy Pace Car program began development, an Explorer Scout post sponsored by Bucik decided to try turbocharging the “new” V6 engine as its latest project. One Buick engineer who had been volunteering his time to help the Scouts mentioned the project to another engineer working on the pace car project. 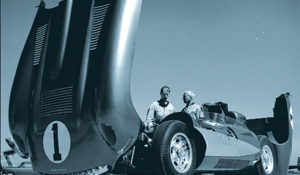 According to Mike, “You can fill in the rest of the story, from ‘Impossible,’ to ‘Let’s try it,’ to ‘It works.’” The output of the engine tripled from the stock V6 thanks to 20–22 psi of boost. Glen Stringfield’s 1976 Buick Century Pace Car purchased from the original owners in Ohio. Greetings Gary, I’m the new proud owner of Glen Stringfield’s 1976 Century Pace Car pictured on your website. I will keep this with me forever. 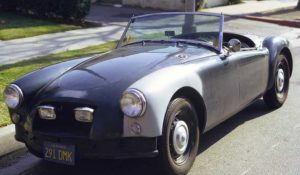 My first car was a 1976 Century that my mother purchased new in 1977. 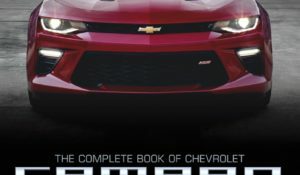 There were very few options on the car and when I turned 16 it was mine with the condition that anything needed was at my expense and I dare not come home with a camaro or trans am! I added every factory option possible and even dropped a 455 stage 1 motor in it. I unfortunately had to part with the car in 2004 but have always wanted a Pace Car since I started researching these things in 1986. This Pace Car recently came up for sale and I knew that it was now or never for me even in hard economic times. It is an exceptionally clean example but I want to take it up a level, as there are few issues I’m trying resolve. The paint is very presentable but not well done and not the correct shade of silver. The graphics are in great shape too but some areas are indeed fading from age. I would like to get information on anything surrounding these cars and would like to try to duplicate the graphics with today’s technology in lieu of having them taped off for another re-paint. Even just having the color codes used would be a tremendous help. I want to preserve this example because 1976 Century Pace Car really is what started the whole turbo charging area for the Buick 231 V6 that ultimately led up to the final Regal GNX. I also own a very rare turbo charged version of the 1982 ½ Grand National. I’m not in it for the money but to preserve Buick’s history and their mark in performance on a rather undesirable V6 platform. Who would have thought that a V6, let alone a Buick, would be a Corvette Killer? It is too bad that today performance is no longer associated with Buick but I will do my best to keep their history alive as a maker of some unique cars that don’t have to be driven by the elderly. Gary, WOW I’m glad you and your friends have taken the time for this site. I just found it and went straight to the Buick info. 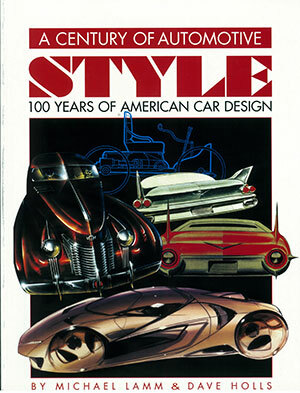 Right now I see down the page the Road Hawk GM Design Story and that is where I’ll go next! Recently I’ve been researching the Buick SkyHawk and have found some interesting info. For 1976 Buick offered a Free Spirit stripe package for the SkyHawk. Very similar to the Pace Car graphics, red wheels, Pewter Gray color, Vari-color graphics. There were only 918 SkyHawk’s made with the FS stripe package for 76. Then for 77 Buick deleted the Vari-color and went to Black or White. Only 385 SkyHawks for 77 were made with the FS stripe package. Would you have any additional information on the FS SkyHawk? Mitch, I don’t remember the ’75 Grand Sport, but I did a quick search on the internet and discovered that there was indeed a Grand Sport for 1975, if in name only. The ’75 Grand Sport would have been done and released by the time I got to Buick. I did a bit of research yesterday and came up with this site. http://www.gminsidenews.com/forums/f21/hemmings-find-day-1975-buick-century-gs-91901/. If you read the whole thread, pretty much tells the whole tale o the 1975 Buick Century Grand Sport. Thanks again. Hello Gary. I just wanted to tell you about my 1976 Free Spirit. In late winter of ’76, I had ordered a Regal fully loaded in Boston Red. The other GM Divisions called it firethorn. I was at the dealership one night, talking to my salesman, when a transport pulled in. Sitting right on top was the most unique car I had ever seen. I asked Bud what it was. He told me it was a replica of the Indy 500 pace car. Not even knowing what it was, I asked if I could buy that instead of the Regal. Long story short, I drove it home the next day. I do not remember how much, but I think it listed for $6600. It had the black Century interior, 350 cu,. in. the Hurst Hatch removable roof panels. It was a real head turner. Shortly after the race, I was hit in the drivers side. I traded it off wrecked. I did end up buying a 1977 regal new later. 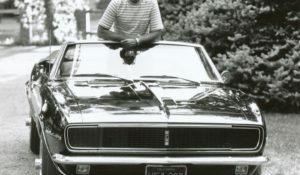 In 2001 I looked at a 1975 Lasabre convertible, and I was told it was 1 of 33 princess cars used at the 1975 500. It was being sold through an auto museum. They told me it was given to Al Unser for his personal use after the race. I could never find proof about that. The people at Indy and Buick were nice. Nobody knew what happened too the cars after the race. I ended up buying 1976 Eldorlado with half the miles on it. The Buick was a beautiful car. My Dad woked with a kid that had a 1975 Free Spirit. It was a beauty! I have owned several lBuicks. I am in the process of rebuilding a Buick Pace car. I am still looking for a console with the entire gear shift and hardware 1976 Buick Century. I am also looking for the rim that goes over the stainless steel band. Please help me in any way possible. My dad had one of the 1976 Indy 500 GMC Pace trucks. I can’t find any pictures or info on the internet of this truck. Here’s a real good picture of this tuck when it was new. I purchased my 1976 Free Spirit new in 1976. Right before I bought it the dealer removed the decals. I am in the process of restoring it to the original and would like to have the decals. If anyone knows where I can purchase the decals please let me know. Thanks! This is an update to those reading your article and in need of the 1976 decals. I had them reproduced using the car you pictured above (previous owner: Glen Stringfield) as they were original to the car. I still own Glen’s car and left the original decals on there for future reference as well. 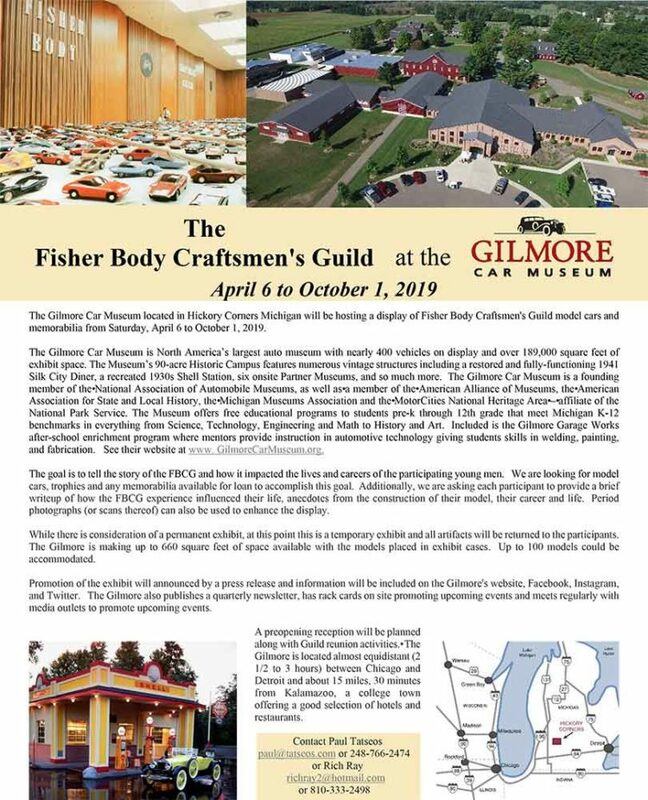 I have since acquired another 76 replica that needs full restoration and decided to take my original car to the place where GM did for all of their Indy 500 Pace Car graphics (so I am told) except for 1976. If my memory serves me correctly based on your feedback from a while ago, your design was carried out by 3M in house at GM for the 1976 pace car instead of subcontracting it out. They also did not keep any records of the colors / templates used. Graphik Concepts was willing to offer their time to have their team of experts reproduce these. They took pictures, measured, mapped & color matched all the graphics. They are available now but produced as needed. A special thanks to Joe Rupp for allowing this to happen and to Graphik Concepts for making them! If you would not mind posting their information so that anyone looking for them can go to the source! My wife and I owned a 75 Pace Car in 1976 and loved the looks and ride but sold it when we could not get the T-tops to quit leaking. Still think I like the 75 better than the 76. I have owned a 66 Skylark GrandSport in high school and my wife owned a 67 GS400 plus I bought a new 78 Regal Sport Coupe when we sold the 75. Had that car for almost 25 years only to surrender it to rust out. Living in Michigan rust has destroyed so many good cars of mine. I purchased one of these around 2009. In wanting to correct some changes made to it I wound up buying a collection of three more, so I now have four of these cars, which I believe is likely the largest collection. After improving my original with parts from some of the others, I’m looking at restoring another. 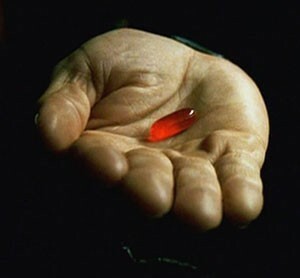 One has no drivetrain so I’m thinking about doing something closer to a true replica with a 231 CI V6 with twin turbos. The picture with the caption “1975 Buick Century Pace Car on a billboard somewhere in Detroit” was taken in front of the Hostess Cake factory on Oakman Blvd in Highland Park which is a suburb of Detroit.